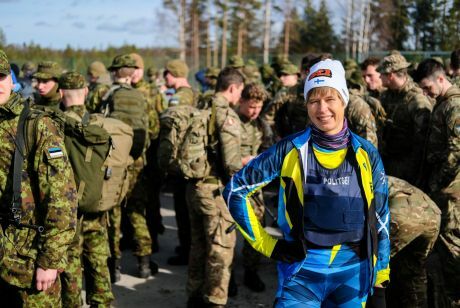 In a creative way to mark 15 years since decisions to accept Estonia to NATO, Estonian President Kersti Kaljulaid has taken part in an annual Scouts Battalion hike, walking 30 kilometres with a 15 kilogram load on her shoulders. Estonian public broadcaster ERR reported that the President noted at the occasion on Friday, March 29, referring to World War Two and the Soviet occupation of Estonia: «Today marks the 15th anniversary of the ratification by the US State Department of our accession to NATO, together with six fellow nations. It is very symbolic that this took place on [former president] Lennart Meri’s birthday, as he made a supreme effort to ensure it, thus avoiding the events of 1939 ever happening again». Despite the Estonian Defence Forces allowing to cover the distance within eight hours, Kaljulaid, a keen runner and cyclist, admitted it was not easy, but still managed to finish the distance in four hours and 19 minutes.